Alex Zetterman takes a break from barn chores to check in with his herd of 20 beef cattle on his St. Agatha farm. 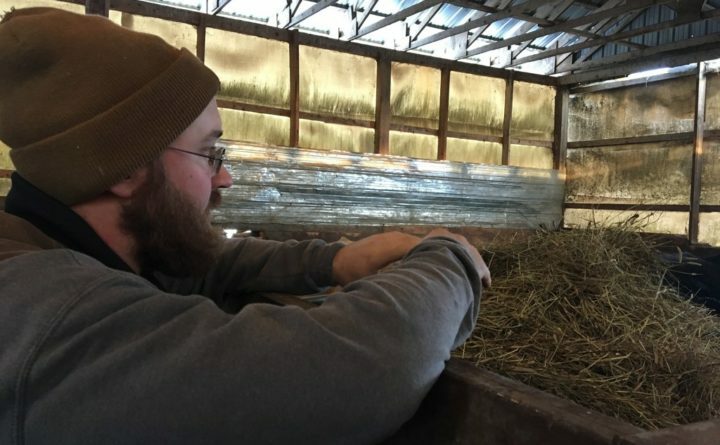 Zetterman is among the new breed of young farmers that are bucking national trends here in Maine, where — counter to other states — the age of farmers is dropping. According to census data from the U.S. Department of Agriculture, the number of farmers age 34 and younger grew by nearly 40 percent in the five years from 2007 to 2012, the most recent time the USDA did a comprehensive agriculture census. That growth surge — from 396 to 551 young farmers — far surpassed the 1.5 percent increase in the numbers of young farmers in the United States as a whole. Ask a farmer why he or she farms, and answers will likely range from carrying on a family business to a desire to maintain a self-sufficient lifestyle. For Zetterman, it was a combination of the two. By the time he was 12-years-old, Zetterman had sold enough eggs and earned enough money to purchase his own pair of beef cows and he was off and running. When his grandfather Glenn Zetterman, a potato farmer, passed away in 2006, Alex Zetterman took over the farm and began raising livestock in place of potatoes. Now his fiance Sabrina Daigle pitches in after her job at Aroostook Mental Health Center is done for day. His father Gary and uncle Glen Jr. also help out when not busy on their own potato farm. Zetterman and Daigle’s son Samson just turned a year old, but already he’s showing signs of being a future farmer. “He loves being out in the barn with chickens or riding in the tractor,” Zetterman said. 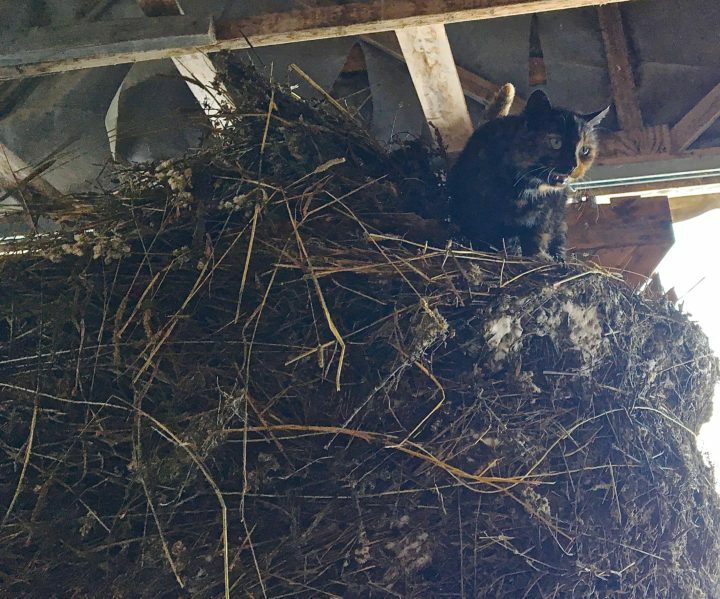 A barn cat peers down from its perch on a pile of straw in Alex Zetterman's barn. Today the farm includes the beef cattle, three draft horses, seven pigs, some rabbits and a combined flock of more than 100 egg-laying chickens, guinea hens, turkeys, ducks and geese. There’s also the four barn cats and Moose — a giant Great Pyrenees who guards the livestock. In the warmer spring, summer and fall months the animals are pastured outside or free to roam in and out of the barn. Come winter, the animals room together in the barn where it can be a squawking, honking, quacking, neighing, mooing, squealing cacophony. Zetterman just grins as he looks over his animals and raises his voice to be heard above the noise. It works because he spends up to 20 hours per week cleaning out stalls, raking up straw and moving animals around so they always have dry bedding. This is on top of feeding, watering and tending whatever medical needs they may have. Those hours double or even triple during haying and calving season. Zetterman also juggles the farm chores with his own off-farm responsibilities including a part time job at Natural Resource Conservation Service office in Fort Kent and working toward his bachelor’s degree in biology and minor in environmental science at the University of Maine at Fort Kent from where he will graduate in May. While not an organic operation, Zetterman prides himself on raising animals that are grass fed and receive minimal medications when needed and no chemical additives in feed. His furred and feathered charges certainly look healthy and happy — not to mention sound it — tucked away in their winter barn, their combined body heat keeping them warm. The beef cows quitely munch hay that was harvested this past summer from Zetterman’s fields while the pigs contentedly root around in their stalls for any tasty treats left over from breakfast. Every stall wall and lower beam seems to have a collection of chickens perching on it and the barn cats watch all the activity from atop piled bales of straw. Only the horses are outside, free to run around in the snow in a fenced paddock before coming back in at the end of the day. 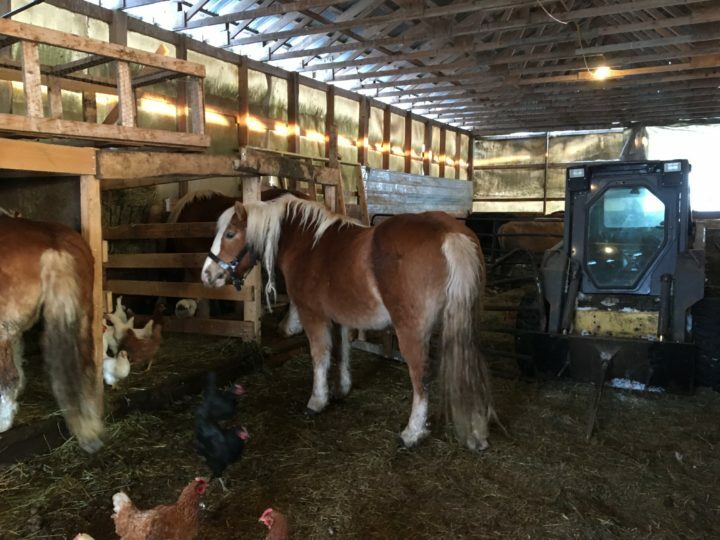 Horses, chickens and other farm animals live together in the Zetterman barn in St. Agatha. Farming, he said, is certainly not for everyone but Zetterman is excited about what he views as a rebirth of local agriculture in Maine. The most recent USDA census data would seem to back that up. In 2000, there were about 7,000 farmers in Maine and farm acres in production were declining significantly. But that changed. In 2012, the USDA survey counted 8,176 farms and 1.45 million acres of land in farms. Ten years prior, it counted 1.36 million acres of land in farms. If that trend continues and more people decide to get into farming, Zetterman said the best thing they can do is talk to established farmers and draw upon their knowledge. With that kind of relationship, he said, new farmers can avoid mistakes that can impact growing and create real financial problems. “I certainly made my own mistakes and would love to help others not repeat them,” Zetterman said. Among the most costly in terms of time and money? On the flip side, he said it’s not uncommon for an established farmer to help a newcomer out by selling quality livestock at reduced rates. Zetterman plans to keep at it and looks forward to the day when Samson is in the fields with him and his family are full time farmers.